There are a number of web sites with "virtual tours" of the canals, including several covering the Peak Forest and Macclesfield Canals that run through Marple. Most of these follow a particular canal from end to end using a series of photographs taken along the route, accompanied by short captions. Rather than try to compete with these other sites on the same level, this tour attempts to complement them by just concentrating on the short but extremely attractive stretch of the canal as it passes through Marple. The object of these pages is to focus on the history and points of interest along the one-and-a-half-mile stretch of the Peak Forest Canal as it travels from its Lower Level at Marple Aqueduct, rising up 209 feet through a flight of 16 locks, to reach the Upper Level at "Top Lock". Travellers on the Lower Level of the Peak Forest Canal heading towards Marple from the direction of Ashton-Under-Lyne, Dukinfield and Hyde, after passing through Hyde Bank Tunnel, will soon have to navigate "The Narrows", which is one of the three starting points on this Virtual Tour that can be used by the boater to approach Marple Locks. On the "Narrows" side of the Aqueduct a footpath on the right descends towards the River Goyt below and passes under the Aqueduct in the direction of Watermeetings Farm. A sign next to the footpath here once spelled "Aquiduct" with an i but that is long gone and now replaced by a new kissing gate installed as part of the improvements made by the Oldknow Legacy Project. The Marple Viaduct runs parallel to the Aqueduct and carries the railway one hundred and twenty-four feet above the River Goyt. The Viaduct was constructed in 1865, 65 years after the Aqueduct and only took a year to build. It comprises twelve stone arches and a steel girder bridge that turns to carry the line diagonally over the canal. Before the locks were constructed this was the head of navigation on the Lower Level and was used for boats to tie up whilst loading or discharging cargo and also to turn around for the return journey. It was here that the Marple Tramway, built to convey goods from the Upper Level before the locks were finished, must have terminated, although no evidence remains to identify exactly how or where. Each bridge on the canal is numbered to aid navigation and make them easily identifiable. Bridge No. 16's official title is "Bottom Lock Change Bridge". This bridge has an unusually long tunnel. It's possible that this is because the Tramway that was used to convey cargo from the upper section passed over the canal at this point, or it may be for some other reason that's no longer clear. Bottom Lock is the first in Marple's flight of 16 locks that raises the canal a total of 209 feet to its highest level at Top Lock, nearly one and a half miles away. Each lock raises the water level by approximately thirteen feet. These locks are said to be the second deepest in the country, the average being only seven feet deep. On the towpath side of the canal at Lock 2 is one of several entrances to Brabyns Park. This former private estate, purchased by the Council in 1942 and opened as a public park in 1949, has many attractions and features including Marple's own historic cast-iron bridge built in 1813. 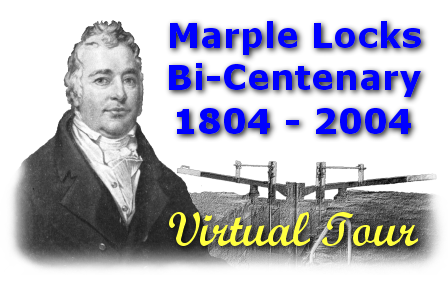 The Marple Website was responsible for launching the campaign to restore this bridge in 2001 and became a member of the Iron Bridge Restoration Project, a partnership set up with Stockport Council and Marple Local History Society. The group completed the bridge's restoration in 2008. Initially there didn't seem to be much to say about Lock 3. However, after being presented with a bit of a mystery with the photograph below, it became apparent that there was more to it than first appearances indicated. You could be forgiven for thinking that this picture looks like another shot of Bottom Lock House taken from Lock 2 but closer scrutiny reveals that several things don't quite fit. For example, the building is quite different - it has no chimney and no windows. It also appears to be in a different position in relation to the lock and the angles can't be replicated from Lock 2.